Manuka Oval will see a men’s test cricket being played for the first time next month. Photo: George Tsotsos. Three of the ACT’s leading cricket administrators left the Hilton Hotel in Sydney after completing a presentation to the Cricket Australia Board. The year was 2000 and there was optimism that they had done enough to secure a berth for Canberra in the Sheffield Shield. What followed was a crushing blow. The ACT not only missing out on a place in the Shield competition but the Canberra Comets were booted out of the domestic One Day Series. It came down to simple jealousy. A number of states voted to exclude Canberra. They believed that if the ACT was to become a major player and host significant matches it would be at the expense of another venue in another state. Ian McNamee, who was one of the three who presented at that fateful Board meeting of Cricket Australia, went on to lead the ultimately successful campaign to secure a men’s test match for Manuka Oval. He has no doubt that parochialism played a major role. So what happened in the ensuing 18 years that so dramatically changed Canberra’s cricketing fortunes? It’s fair to say two significant events took place, which provided that window of opportunity. 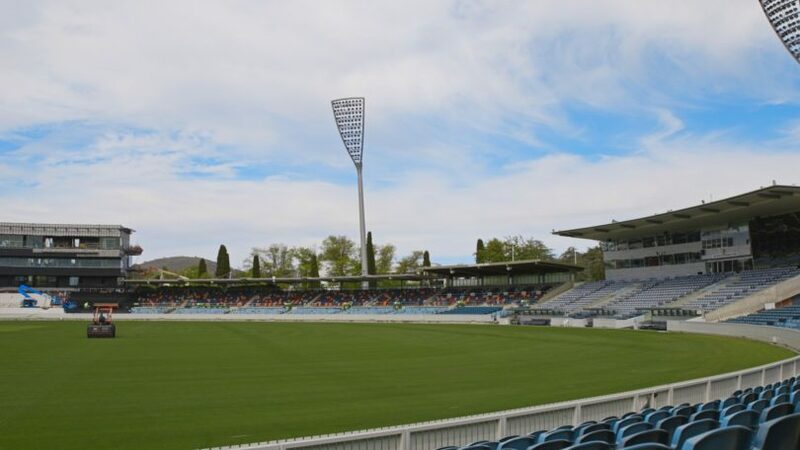 First, the installation of lights at Manuka Oval allowed Canberra to finally prove that they could stage international cricket. This resulted in Canberra hosting the first Australia versus West Indies day-nighter in 2013. Hopes to secure a test in 2013 to celebrate the city’s centenary didn’t come to fruition. Then there was the reform of the Cricket Australia Board, which allowed centres such as the ACT a greater say in the running of the game. It effectively eradicated the parochialism, which had previously prevented Canberra from securing major cricket matches. As this was going on, there was a campaign, driven by Ian McNamee and the ACT Board, to make sure Cricket Australia was left in no doubt about their ambitious quest to host a test match. A key agitator for this to happen was one of the ACT’s most influential cricket administrators, Murray Radcliffe, who made sure the message was constant. In the wake of the Board reform, Cricket Australia was open to the idea of Canberra securing a test. ACT’s softly-softly, but constant campaign, paid off. So as Canberra prepares to host its inaugural men’s cricket test, there will be a certain amount of satisfaction within a small group of ACT cricket administrators. Hats off to them!